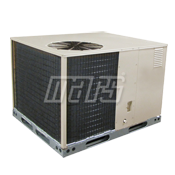 Comfort-Aire Packaged Units | Superior Supply Co. The self-contained TGRG series provides electric air conditioning in warm weather and comfortable gas heat in cold weather. The compact design makes it ideal for homes without a basement or adequate utility space. Since the unit can be slab-mounted or roof-mounted, it also works well for residences with minimal yard space. Units come pre-charged with environmentally friendly R-410A. commercial applications. Units can be converted for horizontal or downflow air delivery. efficiency combined with quiet operation. Both indoor and outdoor coils are all-aluminum micro-channel type that maximizes heat transfer. These coils are highly resistant to corrosion, small and lightweight to keep the overall size to a minimum, and easier to clean than other types. An epoxy coated wire guard and mesh hail guard protects the coils from damage from both yard hazards and weather extremes. Water management is provided by a one-piece top with drip edges on the top panels, while an embossed bottom pan keeps the blower compartment dry. A full range of accessories including roof curbs, economizers, and LP conversion kits is available. minimize size and cost, and increase durability and reliability. • Environmentally friendly R-410A Refrigerant. The self-contained TPRG series heat pump is a unique, all weather comfort-control appliance that will heat and cool your building year round and provide energy saving comfort. It’s an unknown fact that heat is always in the air, even when the outside temperature is below freezing. The heat pump uses basic laws of physics to provide energy saving heat during the winter months. 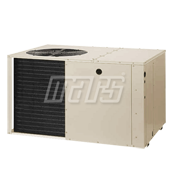 In colder temperatures, the heat pump performs like an air conditioner run in reverse. Available heat energy outside the building is absorbed by the refrigerant and exhausted inside. This efficient process means you only pay for “moving” the heat from the outdoors to the indoor area. You do not pay to generate the heat, as is the case with more traditional furnace designs. During summer, the heat pump reverses the flow of the heat-absorbing refrigerant to become an energy-efficient, central air conditioner. Excess heat energy inside the home is absorbed by the refrigerant and exhausted outside the building. This unit uses environmentally friendly R-410A refrigerant.